Apples of Gold presents a bold, beautiful, and extremely durable wedding ring choice for couples about to tie the knot. These titanium wedding bands are specially crafted to show off the metal's excellent gray color, but they don't sacrifice strength. As one of the strongest, lightest metals available for jewelry, titanium is a great choice for active couples. 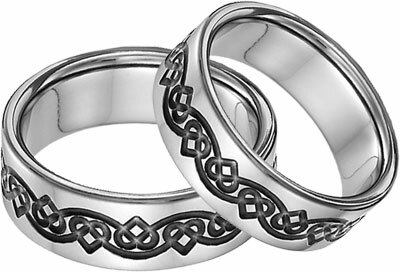 These bands also show off a Celtic heart knot pattern that is given a bold black color for added interest and style. Band 7mm wide. Also available in 6mm-10mm widths. We guarantee our Black Titanium Celtic Heart Wedding Band Set to be high quality, authentic jewelry, as described above.